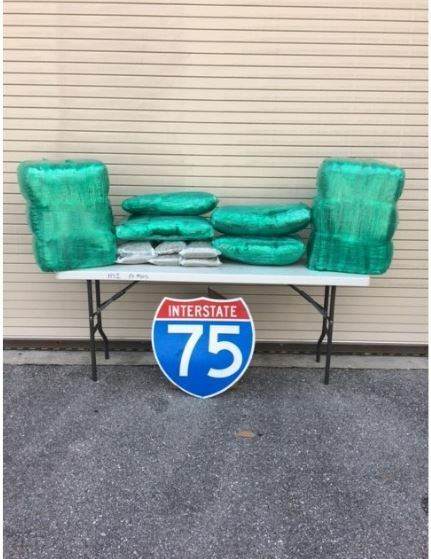 FORT MYERS, Fla. –Detectives with the Lee County Sheriff’s Office Highway Interdiction Unit stopped two vehicles traveling southbound on I-75 for traffic infractions Tuesday. During the stop, K9’s smelled narcotics in both of the vehicles and alerted the detectives. A search of the Ford F350 truck revealed boxes containing 94.4 pounds of marijuana prepackaged for sale. A second search of the Cadillac SUV revealed 14 grams of marijuana and $6,000. Further investigation revealed the location of additional narcotics in Naples, Fla. During a search warrant, five more pounds of marijuana and several firearms were also found. Anthony Fernandez, 23, was arrested for trafficking over 25 pounds of marijuana. Kimberly Rodriguez, age 46, and her son, German Rodriguez, age 28, were arrested for conspiracy to commit trafficking over 25 pounds of marijuana and possession of marijuana under 20 grams. The street value of the of the marijuana is approximately $300,000.